Hayato's city is devastated by a giant robot, his parents are killed in the massacre. The only friend left to him is his dog Jack, the only things left are mom's shoe and a picture of a man and a woman who, as his father tells him on his deathbed, are his real parents. Now Hayato wants revenge on the one who is said to have sent the robot: the terrible Ghost Ship which threatens ships and is rumored to wish to exterminate everything. But then Hayato stumbles on a secret underground factory of Mr. Kurosio, owner of mostly everything in the city - and realizes things are not as Mr. Kurosio has been telling him... Someone terrible lives in a castle under the sea... Hayato is trying to tell people the truth - but his life is now in danger by from the one who does not wish to be known. Then Hayato is saved by no other than the captain of the Ghost Ship... Hayato is about to uncover more than the one secret he has been searching for. 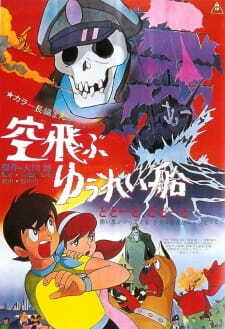 Flying Phantom Ship is a wonderful mystery spectacle for anyone who loves over the top anime. this film was hard to predict, so many events come out of nowhere. things like Giant robots kaiju attacking a city or A spectral skeleton that is out for revenge stepping out from the shadows that possess a flying ghost ship poised with lasers and rockets! if that doesn't make you curious how about a dog that carries around a bag of momentous? at its core this is a film about a boy and his dog and is a metaphor for the sudden moments of loss and hardships in life. Not a very deep story by any means but much of the joy this film brings is brought from the old school animation and visuals, not to mention all the crazy things that just happen. I would recommend watching this with friends.